I'm always looking for ways to use Photoshop more efficiently. My recent obsession has been finding keyboard shortcuts to work with layers. Claiming that you'll be a layers ninja after reading this might be a stretch. But try these tricks while your fellow designers are watching, and your stealthy sleight of hand will probably blow their minds. The first one has been pretty well documented. Holding down Cmd + J (Mac) or Ctrl + J (PC) duplicates the current layer selected. Easy right? Let's move on. After duplicating a layer using the shortcut above (Cmd + J), Photoshop positions the new layer above the original layer. In many cases I want the duplicated layer to appear below the original layer. Honestly, who can afford the time to be bothered with manually moving each duplicated layer to a new position in the layers palette? (Answer: Nobody) To solve the problem, I created a simple action (download it below) that both duplicates the layer and automatically positions it below the original layer by pressing F11. Did you even see what I did there? No, you didn't. Amazing! I'm a little obsessive about organizing my layers into groups. 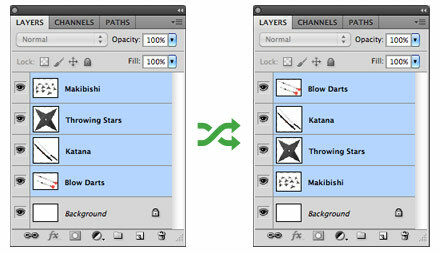 When a layer group is selected in the layers palette, the Duplicate Group menu item appears under the Layers menu. Since there is no keyboard shortcut defined, you can define your own under Edit > Keyboard Shortcuts. 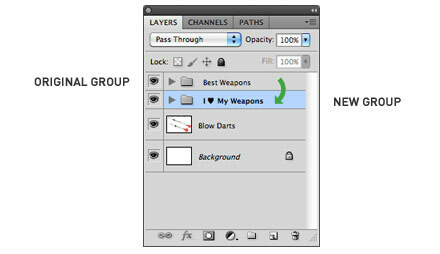 Similar to layers, the new layer group will be placed above the original group. Actions to the rescue again. Pressing F12 duplicates my layer group and automatically places it below the original group. 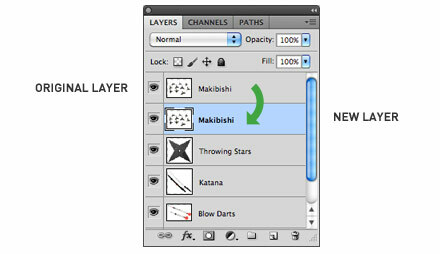 If you didn't use the Duplicate Layer Below action, you might have a mess of layers that are in the wrong order. You could go out and buy a latté in the time that it would take to reverse the layers one-by-one. Luckily there's a hidden menu item called Reverse under Layers > Arrange. Simply select all of the layers that need to be reversed and Photoshop will do the heavy lifting. If you do this a lot, set up a keyboard shortcut do speed up the process. Unzip the file and copy the .atn file into the Photoshop > Presets > Actions folder. Open the Actions palette in Photoshop and click on the contextual menu arrow in the upper right corner. Select Load Actions and find the file on your computer. To change the keyboard shortcut for these actions, double click on the action layer and a box will open with options. These are just a few of the things that I use every day. 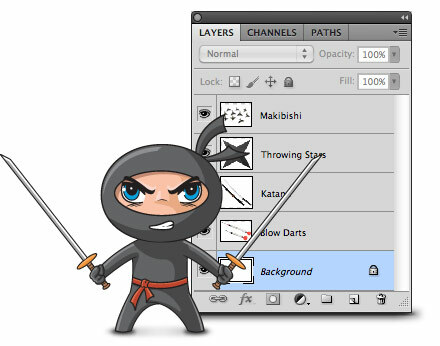 If you have more ninja style tricks that help you work with layers, I'd love to hear them.